The 2000 SVT Ford Mustang Cobra R’s 5.4-liter 4-valve DOHC V8 engine, which produces an estimated 385 bhp and 385 lb.-ft. of torque, gives the Ford Mustang Cobra R its own performance benchmark that established the car’s ultimate overall performance. The basis for the Ford Mustang Cobra R’s engine is Ford’s Triton 5.4-liter cast-iron modular block and forged-steel crankshaft. While the cylinder bore is the same as the 4.6-liter aluminum-block engine, this block’s deck height is 29mm taller. The stroke is 15.8mm longer (105.8mm vs. 90.0mm for the 4.6-liter), which provides the added displacement. To install the taller engine, new engine mounts and a lowered crossmember were combined to lower the engine by 12mm inside the body. The Ford Mustang Cobra R’s forged crankshaft is fitted with Federal Mogul rod bearings, Carrillo billet-steel connecting rods and forged aluminum pistons. The forged-aluminum pistons are similar to those found in the SVT Lightning. They are modified with increased wall and pin strength for high rpm use, and with flat tops to increase the Ford Mustang Cobra R’s compression ratio to 9.60:1. The engine also has a new crankshaft vibration damper, which is tuned for increased firing loads and higher rpm. At the bottom of the engine, a high-volume Canton Racing Products oil pan, with its internal baffle system, maintains a consistent oil supply under the high g-forces of racing conditions. A Canton Racing Products windage tray also is used for reduced oil aeration and increased horsepower. Ed Olin, systems engineer at Ford’s Advanced Powertrain Engineering, saw the powerplant through its development. He says the Ford Mustang Cobra R’s specially designed 4-valve cylinder heads are the key to its power. All told, peak airflow is increased by more than 25 percent over the 4.6-liter Ford Mustang Cobra cylinder head. The engineers achieved this by reshaping the intake and exhaust ports, redesigning the intake and exhaust valve heads, and increasing the exhaust valve diameter by 2mm compared with the 4.6-liter engine. 2000 Cobra R Camshafts also are similar to the 4.6-liter Ford Mustang Cobra, but with much more aggressive opening and closing rates and much higher lift. Intake and exhaust valve lifts are 13mm and 12mm respectively, versus 10mm for both intake and exhaust on the 4.6-liter Ford Mustang Cobra engine. 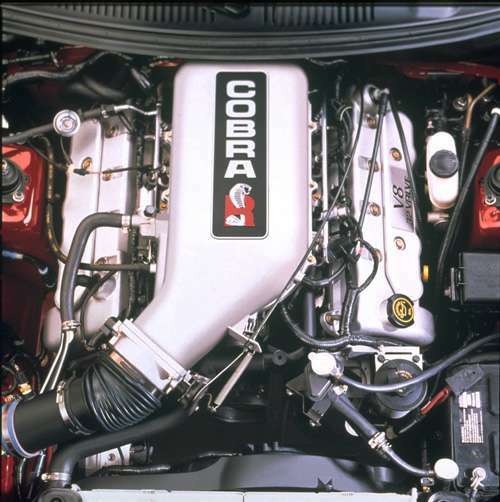 The 2000 Cobra R cylinder heads are secured to the block with special high-strength bolts, and the primary timing chains are production 5.4-liter units that have been micro-polished for high rpm use and high-load durability.